Chalcedony is an opaque semi-precious gemstone which comes in a variety of pastel shades. These are usually dyed but blue chalcedony does occur naturally. 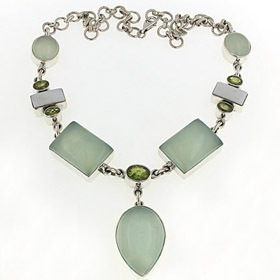 Chalcedony is all about the gorgeous colour and even texture and makes a gorgeous necklace. For further information read About Gemstones. Chalcedony necklaces compliment pastel fashion colours perfectly!